Kids at TAEC Laos before GoAnimate for Schools. Today, we are thrilled to announce the most recent member of the GoAnimate for Schools family: the Traditional Arts and Ethnology Centre (TAEC Laos) in Laos. So far, we have shied away from using technology. We don’t really have the staff expertise to do more advanced things, like making video, ourselves. We also have not had the funds to hire people to help us with these kinds of projects. As you might guess, I was really excited to come across your resource. 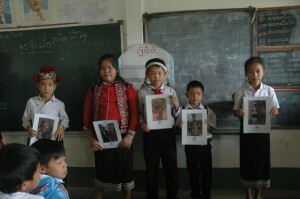 Museums, and particularly museum children’s programs, are a new concept for Laos. Because of that, it is harder to draw local children to our activities—they are unsure of what we are. Some kids from the neighborhood come and do our print-based activities, but if we had something for them to watch, I’m sure there would be much more interest. That’s why I was thinking we might be able to use your service to make a short animation series, or a longer video and host a children’s movie event—either after school, a weekend morning, or in the evening—to draw more children to our space and ignite discovery and interest in the rest of our resources. …I think it would be an incredibly useful tool in building our diversity awareness educational materials, as well as reaching more remote parts of the country. We look forward to hearing about Alicia’s creative use of GoAnimate for Schools and the kids’ experiences in a few months’ time! Be sure to check back here to learn more about how Alicia incorporates GoAnimate for Schools into her program.